This CD was first issued in 1969 as an LP on Trojan records High Note label subsidiary. 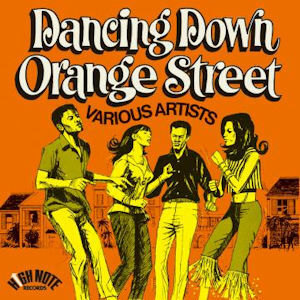 Dancing Down Orange Street, produced by Sonia Pottinger, from her Gay Feet label and recording studio in Jamaica. Nearly all the tracks have been released on the Doctor Bird and High Note labels in the UK. It is released first on CD with 13 additional bonus tracks, again all Sonia Pottinger productions and all originally released on High Note 45s in the UK. This is well packaged CD with sleeve notes by Andy Lambourn and Marc Griffiths, together with photos and label scans. Nice to see the Doctor Bird imprint reissued again. Issued on Doctor Bird DBCD-04.